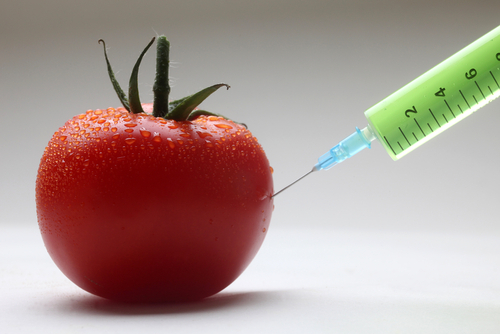 Scientist are currently developing a new cost-effective and easy to administer vaccination through genetically modified foods. These edible vaccines will aid in delivering lifesaving vaccines to developing countries where traditional medical care is not readily available. vegetables. Scientists begin altering the plant’s genes as seeds allowing scientists to grow entire farms of edible vaccines. As the plant grows the cells produce whatever protein is needed for the chosen vaccine. Once the plant is ingested immunization begins, causing the body to produce the necessary antibodies to fight disease. Though regulations and stipulations regarding the widespread application of biopharmed produce are still impeding upon high levels of extensive research, the field of biotechnology has continued to make significant strides in raising consumer awareness around the real world implications that accompany this technology, particularly in developing countries. The mortality rates in third world countries are largely dictated by deaths caused by vaccinated infectious diseases such as malaria and tuberculosis, neither of which are endemic in developed countries such as the United States. The implementation of biopharmed produce, if effectively grown and distributed, would dramatically cut the costs of disease prevention in countries like India, which spends approximately half of its total health budget on malaria control. Scientists have found the best results in modifying the seeds of bananas, tobacco, and potatoes. Tobacco was found to be the most effective in terms of how the modified seeds grew and how it limited the amount of contamination of other plants when being grown. Potatoes were also found to be effective but only if eaten raw. When scientists tested the efficiency of a cooked potato, they found that a lot of the proteins that were added through genetic modification had been destroyed. Although for most people, the banana has the most appeal because it is a very sweet and easy to eat fruit. Also, it can be transported easily and is extremely cheap to produce at ten cents a dose. 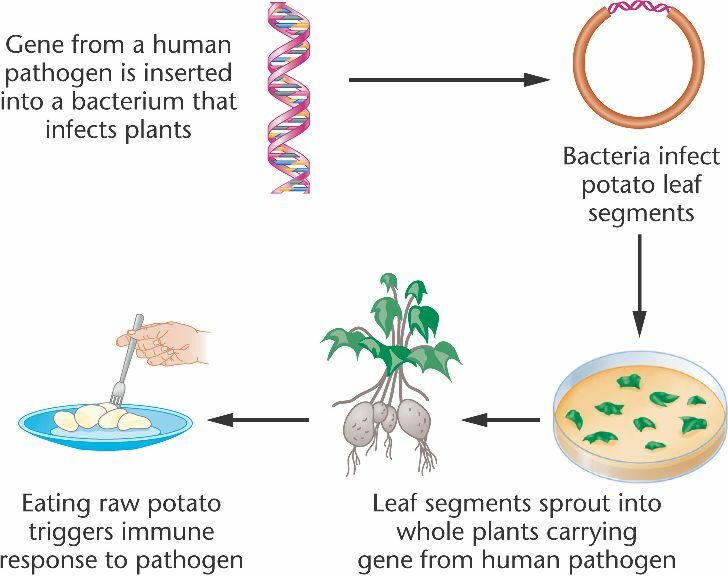 Just as any emerging technology the transgenic plant vaccines went through a human trial run where 14 adults were given either 100 grams of a transgenic potato, 50 grams of transgenic potato, or 50 grams of a normal potato. Each of these potato samples contained a range of 3.7 to 15.7 g of LT-B. This is a protein that induces the inflammatory response in humans. These potatoes were eaten raw because if they are cooked the protein injected into them would leave the potato. After the test was done ten of the eleven people that ingested the transgenic potatoes developed immunoglobulin G (IgG), which is a type of antibody. This is produced during the immune response when LT-B is activated. This test opened a whole new path to delivering vaccines to people in a cheap and effective way. One of the newest developments in edible vaccinations came during the recent Ebola outbreak. With much of modern medicine, including the Ebola vaccination, being accessible only to the rich, scientists in the U.S wanted to find a vaccine for the developing world. Professor Charles Arntzen of Arizona State University believed that plants could be the answer. His team began researching and discovered that tobacco plants were ideal for housing the much needed Ebola vaccine, ZMapp. Like other edible vaccines, the desired antibodies are produced by fusing their genes to the genes of the tobacco plant. The tobacco is then injected with an artificial virus, stimulating antibody production. Though revolutionary in the fight against Ebola, the tobacco vaccine does have its complications. The outbreak required a large quantity of vaccinations which, with edible vaccines, is hard to develop in a short amount of time. 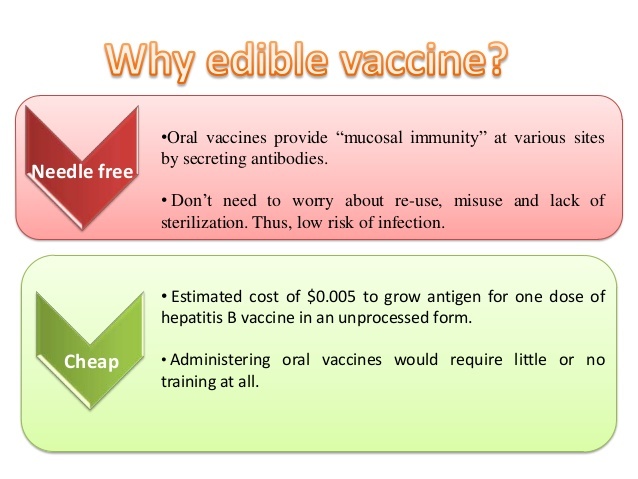 For now edible vaccines are still in development, but as time goes on and research continues they are becoming a viable option as an easy, inexpensive alternative to traditional vaccines.